North Korea's state media says leader Kim Jong Un will follow his summit with U.S. President Donald Trump with an "official goodwill visit" to Vietnam that will continue through Saturday. The Korean Central News Agency on Wednesday reported Kim's arrival at the Vietnamese capital of Hanoi and said he received briefings from North Korean officials on the working-level talks with Washington to set up his summit with Trump. The KCNA says Kim during his visit to the North Korean embassy on Tuesday urged diplomats at the embassy to work toward deepening cooperation between North Korea and Vietnam. Kim arrived in Hanoi after an almost 70-hour train ride cutting through southern China. 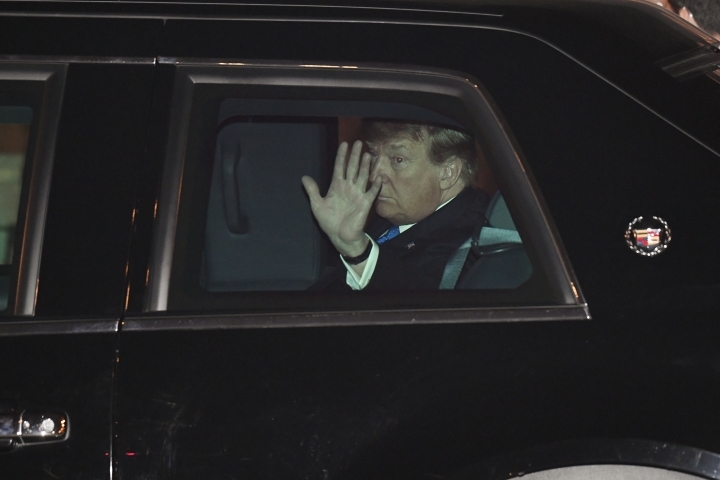 President Donald Trump has arrived at the hotel in Hanoi where he will stay during his summit with North Korea's Kim Jong Un. 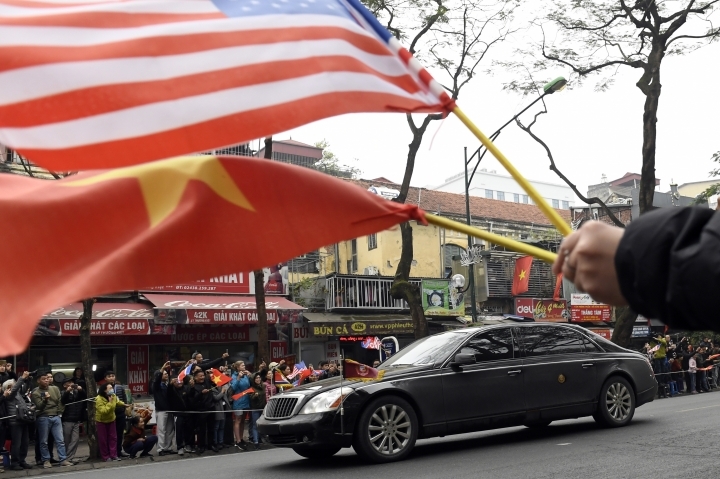 Trump's motorcade sailed through the empty Hanoi streets Tuesday night, crossing a bridge decorated with flags from the United States, North Korea and Vietnam. But as he drew near the city center, crowds were gathered on the streets with many holding up phones as he drove by. Other people looked out from second and third story windows. Trump is in Vietnam for his second summit with Kim. The two men first met last June in Singapore, a summit that was long on historic pageantry but short in any enforceable agreements for North Korea to give up its nuclear arsenal. U.S. President Donald Trump has greeted officials in Vietnam, where he'll be meeting with North Korean leader Kim Jong Un. A red carpet was rolled out by the stairs of Air Force One, and soldiers lined up at attention as Trump walked down the stairs and began shaking hands of the officials who were there to greet him on the tarmac. 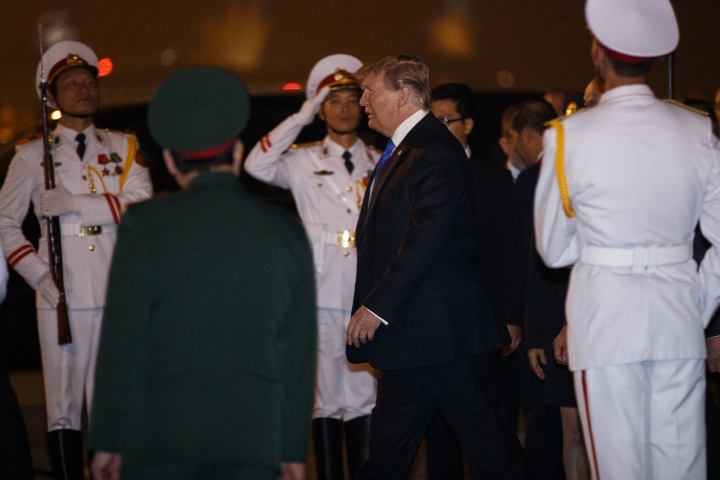 Trump arrived in Hanoi on Tuesday evening, hours after Kim arrived in the Vietnamese capital by customized armored train and limousine for their second summit. The two men first met last June in Singapore, a summit that was long on historic pageantry but short in any enforceable agreements for North Korea to give up its nuclear arsenal. Trump has praised Pyongyang for ceasing nuclear tests and has appeared to ease up on demanding a timeline for disarmament. Kim is expected to ask for relief from crushing U.S. sanctions. 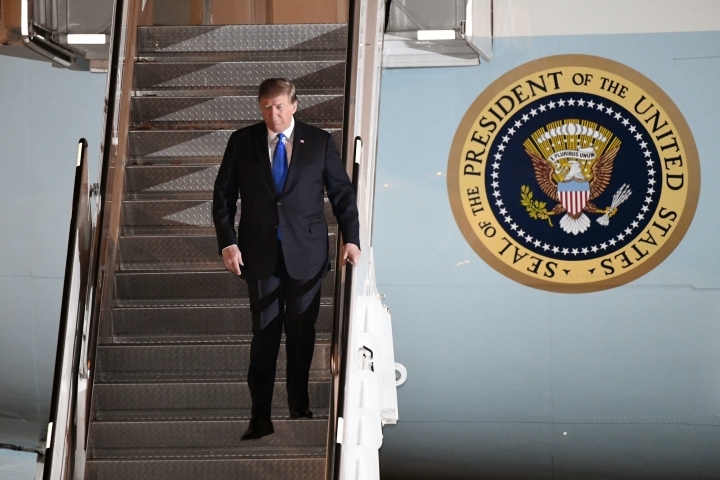 U.S. President Donald Trump has arrived in Vietnam for a second meeting with North Korean leader Kim Jong Un. Trump aims to get Kim to give up nuclear weapons in exchange for relief from sanctions hobbling his economy and better relations with the U.S. and other nations. North Korea has meticulously prepared for leader Kim Jong Un's summit with U.S. President Donald Trump in Vietnam, but his arrival still had its hiccups. South Korean media compared a North Korean interpreter to Usain Bolt after he made a desperate sprint to catch up with Kim as the leader walked out of his train to meet waiting Vietnamese officials. Kim arrived in Vietnam on Tuesday after an almost 70-hour ride in his armored train through southern China. His green-and-yellow train had to back up after overshooting the red carpet prepared at Vietnam's Dong Dang station. Minutes later, Kim stepped out of the train and was momentarily alone as he walked toward Vietnamese officials who came to greet him. 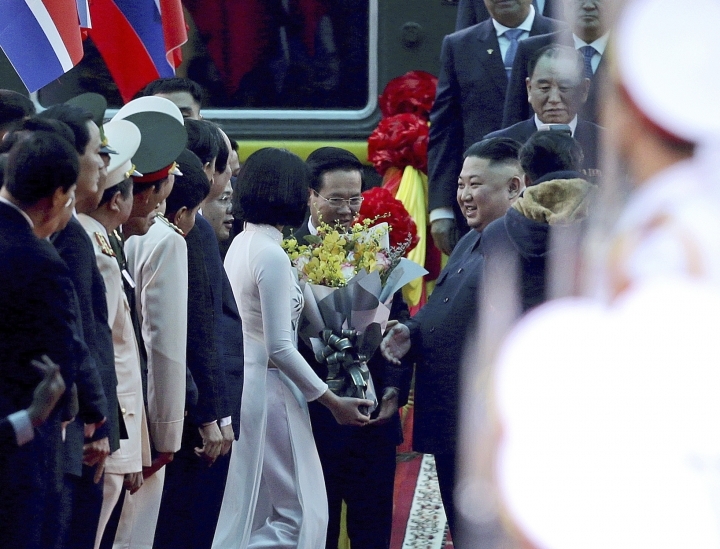 Kim's interpreter wiggled through senior North Korean officials waiting at the train's door and dashed after Kim, catching up with him just as he shook hands with the Vietnamese officials. 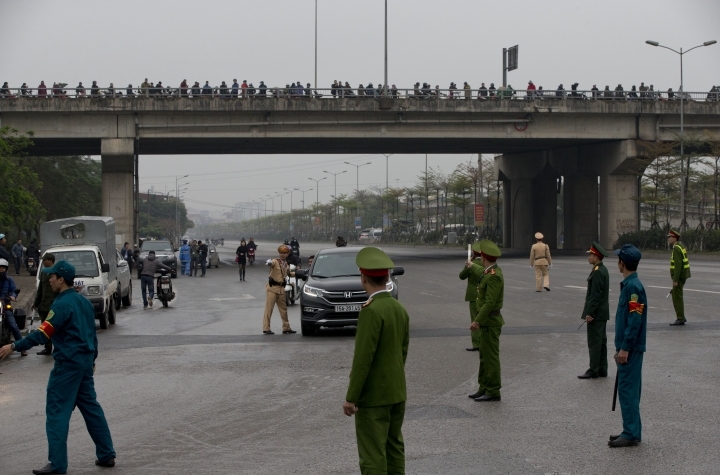 North Korean leader Kim Jong Un has left his hotel in Hanoi for a visit to the North Korean Embassy. Kim's black limousine was seen departing the Vietnamese capital's Melia Hotel on Tuesday evening flanked by bodyguards. The convoy was escorted by motorcycle outriders as curious spectators and journalists looked on. Upon arriving at the embassy a short drive away, more bodyguards took up positions alongside his car. Loud cheers could be heard as he entered the compound. Kim is in Vietnam to meet with U.S. President Donald Trump starting on Wednesday. China is urging North Korea and the U.S. to "meet each other halfway" in talks between Kim Jong Un and President Donald Trump starting Wednesday. Foreign ministry spokesman Lu Kang said China hopes that the talks will achieve denuclearization and lasting peace and stability on the Korean Peninsula and in northeast Asia. He said to achieve those goals, North Korea and the U.S. should fully understand each other's legitimate concerns and "meet each other halfway." ''Legitimate concerns" is a reference to North Korea's call for security guarantees from the U.S.
Lu told reporters at a daily news briefing on Tuesday that China believes the situation is "developing in the direction as we pursued and expected," and that Beijing will encourage both sides to work toward an agreement. North Korean leader Kim Jong Un's liquor cabinet may just have taken a big hit. Customs officials in the Netherlands say they have intercepted a cargo of some 90,000 bottles of Russian vodka that they suspect was being smuggled to North Korea in breach of United Nations sanctions. Dutch newspaper Algemeen Dagblad reported the discovery Tuesday and Customs office spokesman Roul Velleman confirmed the details. Velleman and the foreign ministry declined to elaborate on why Dutch officials believe the vodka was heading to North Korea. Dutch Overseas Trade Minister Sigrid Kaag congratulated the customs officials on the interception, saying, "the U.N. Security Council has imposed clear sanctions on North Korea and it is important to enforce them." The vodka was discovered last week in Rotterdam port under an aircraft fuselage in a Chinese container ship. Two North Korean defectors have flown to Vietnam to wish for progress during a second summit between their former leader Kim Jong Un and President Donald Trump. They were among the crowd of people and journalists gathered near a Honoi hotel where Kim is staying following his arrival Tuesday. One defector Shin Eun Ha says she hopes the summit will help achieve peace so that she's allowed to return her home in the North's northeastern town of Musan. She says she fled from North Korea in 2003 when Kim's late father Kim Jong Il ruled. Shin says Kim Jong Un's father and grandfather were a "god-like figures" when she was in North Korea. She says it is the first time for her to be at the same neighborhood with a North Korean leader. Air Force One is making its second refueling stop at a military base southwest of Doha, Qatar, as President Donald Trump makes his way to Vietnam for his second meeting with North Korean leader Kim Jong Un. Trump's presidential aircraft landed at al-Udaid Air Base, which houses the U.S., British and Qatari air forces. His plane first stopped for fuel in Mildenhall, England. Trump is expected to land late Tuesday in Hanoi and will meet with Kim for dinner on Wednesday, followed by official meetings on Thursday. Kim, who traveled to the summit by rail and car, arrived earlier Tuesday. North Korean leader Kim Jong Un and the White House press corps booked the same hotel. Guess who won? 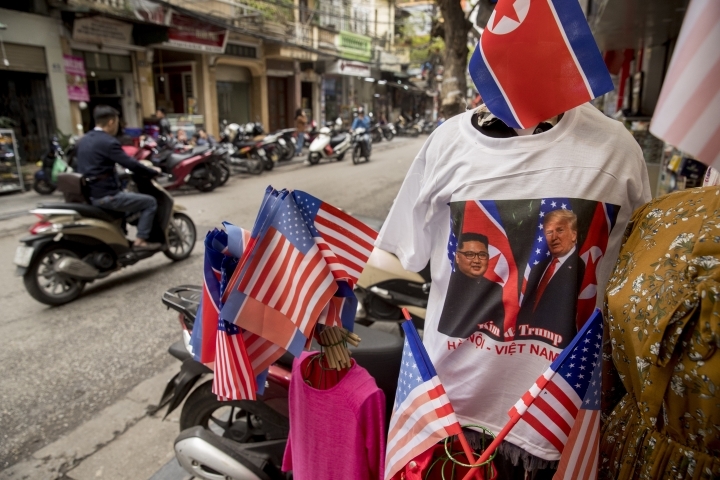 The White House reporters, cameraman and photographers were set to be using a filing center at the Melia Hotel in Hanoi, Vietnam's capital, for Kim's meeting with President Donald Trump. 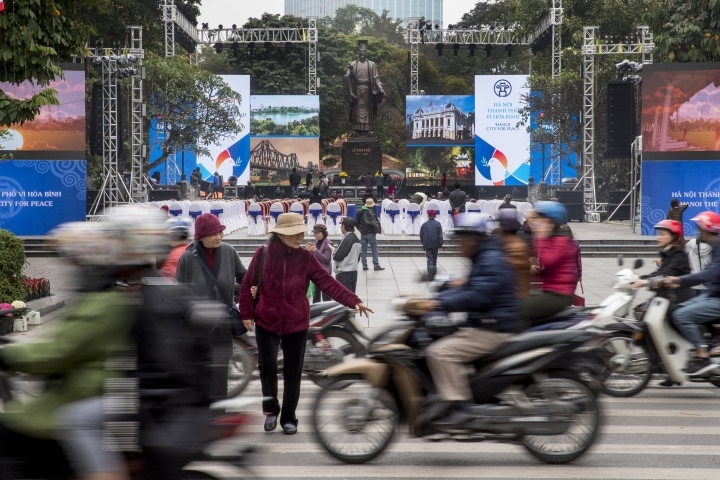 But on Tuesday, Vietnam's Foreign Minister said they were being relocated to an international media filing center about a seven-minute walk away. The White House did not say why the move was made and it was unclear who booked first. A few hours after the move was announced, Kim's motorcade rolled up to the hotel. When security started to tighten at the hotel on Monday, reporters were in disbelief that the Western press corps was going to be amassed at the same place as the reclusive North Korean leader. 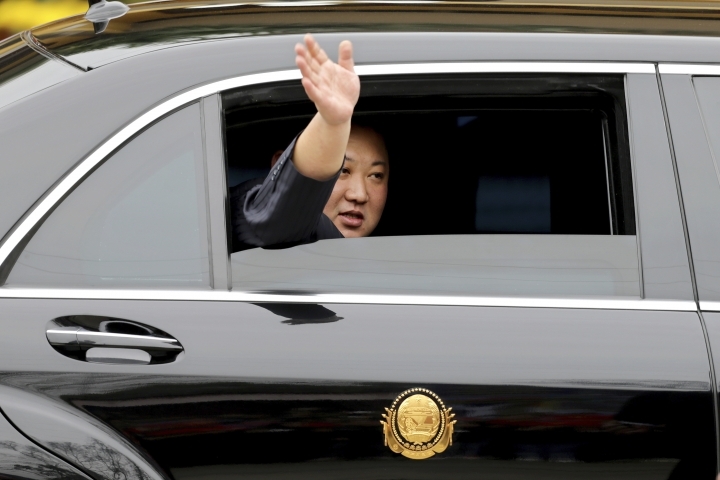 People lined the streets to greet North Korean leader Kim Jong Un as his limousine rolled up to the hotel in Vietnam's capital where he's staying for his second summit with President Donald Trump. A fine mist of rain fell on the crowd as his motorcade arrived behind security cars with loud sirens. As it passed, they cheered and waved Vietnamese, North Korea and American flags. They didn't see Kim's face, only his car, which had darkened windows. Seventeen-year-old Hung Nguyen, who walked outside his high school to see Kim, says he thinks Kim is truly serious about giving up his nuclear weapons. Asked about a possible declaration ending the Korean War, he said if the war was indeed over, governments could spend more on hospitals and technology. Japanese TV footage has shown North Korean leader Kim Jong Un taking a pre-dawn smoke break at a train station in China hours before his arrival in Vietnam for his summit with President Donald Trump. The video broadcast by TBS on Tuesday shows Kim taking a drag on a cigarette and talking with North Korean officials at China's Nanning rail station. 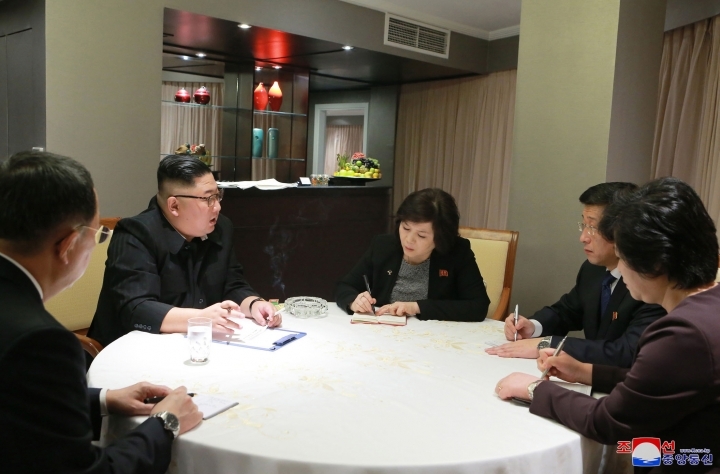 A woman who appears to be his sister Kim Yo Jong is seen holding a crystal ashtray. Kim arrived in Vietnam on Tuesday after an almost 70-hour train ride that cut through southern China. Kim is frequently seen with a cigarette in his hands. North Korean TV even showed him casually smoking in front of one of his liquid-fuel ICBMs in 2017. 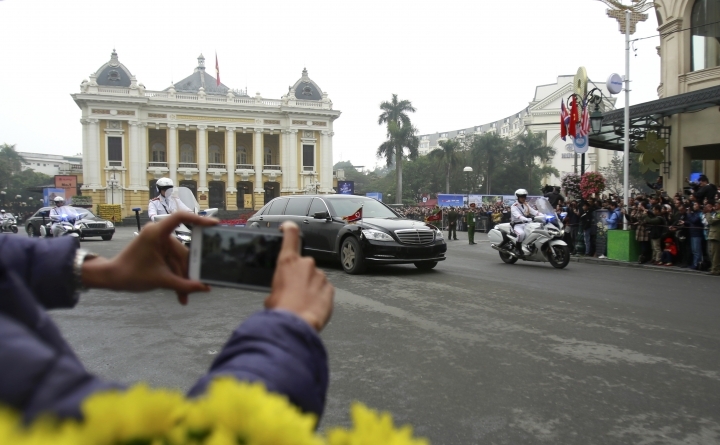 North Korean leader Kim Jong Un's limousine has rolled into Vietnam's capital, Hanoi, ahead of his meeting Wednesday with President Donald Trump. 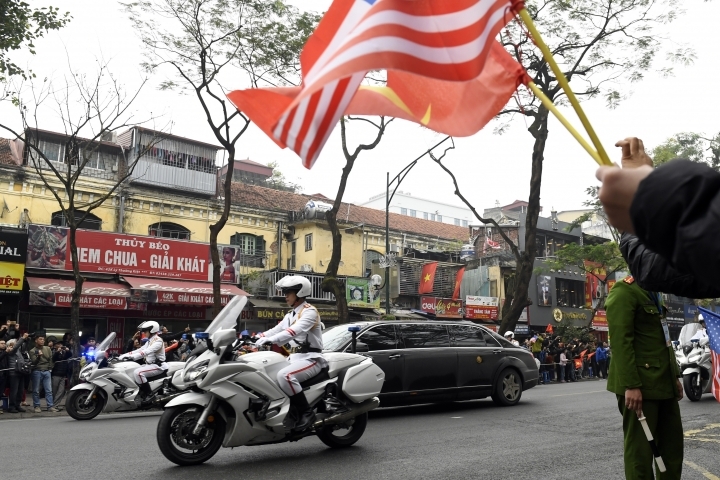 Roads on Tuesday were shut down from the border with China all the way to Hanoi, 170 kilometers (106 miles) away, and soldiers and police milled around the Melia Hotel where Kim was set to stay. Crowds of citizens and throngs of media stood behind barricades hoping to catch a glimpse of the North Korean leader. Outside of the city's famed opera house, around the corner from the Metropole Hotel, which is thought to be the summit venue, hundreds of people waited to catch a look at the motorcade. Dozens of anti-Pyongyang protesters in South Korea's capital have ripped portraits of North Korean leader Kim Jong Un and called for President Donald Trump to press Kim over the North's dismal human rights record at their summit this week. The protest in Seoul came as Kim arrived in Vietnam by train. The protesters also opposed a potential declaration between Washington and Pyongyang to formally end the 1950-53 Korean War, saying the North would use the declaration to call for the United States to reduce its military force in the South. North Korea's human rights issues aren't expected to be on the agenda during Kim's meeting with Trump, who after their first summit last June in Singapore described Kim as a "great personality" who "loves his people." Trump had condemned the cruelty of Kim's government earlier in his presidency but seemed to play down the severity of the North Korea's human rights violations following the Singapore meeting. North Korean leader Kim Jong Un is being accompanied in Vietnam by a group of top lieutenants including his influential younger sister. Kim arrived by train at the Dong Dang railway station on the China-Vietnam border on Tuesday and is on his way to Hanoi for a summit with President Donald Trump. Kim's younger sister Kim Yo Jong was seen before the leader stepped out of their special train and took a black limousine waiting for him at the train station. Before Kim Jong Un's arrival, North Korean officials who had arrived in Vietnam in advance, including his top representative for U.S. affairs, Kim Hyok Chol, had gathered at the train station. Also accompanying Kim Jong Un is Kim Yong Chol, a former military intelligence chief who has been deeply involved in nuclear diplomacy since North Korea entered talks early last year. After barreling through China for three days on his green-and-yellow armored train, North Korean leader Kim Jong Un has switched to another mode of high-security transport after arriving in Vietnam. He's now traveling in a massive bulletproof Mercedes encircled by bodyguards. After arriving at Vietnam's Dong Dang Station, Kim shook hands with Vietnamese officials and waved to the crowd before stepping into the limousine. 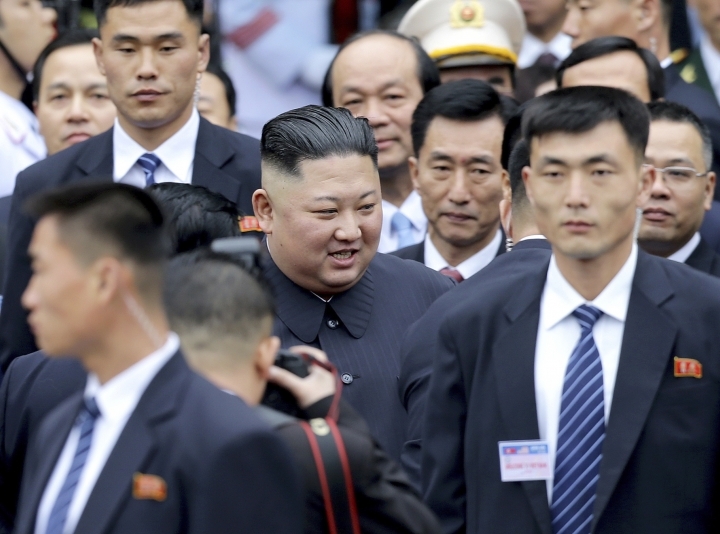 A dozen of crew-cut bodyguards flanked the vehicle and ran in formation as it slowly rolled out of the station and headed to Hanoi, where Kim will meet President Donald Trump for their second summit. Kim's bodyguards also ran alongside his limousine during his summit with Trump last June in Singapore and his summit with South Korean President Moon Jae-in last April. Kim Jong Un's train has arrived in Vietnam for the North Korean leader's second summit with Donald Trump. Vietnamese troops in crisp white uniforms and black boots stood at attention Tuesday to welcome Kim on a red carpet beneath large North Korean and Vietnamese flags at the Dong Dang railway station on the China-Vietnam border. A crowd gathered along the road near the station to wave North Korean flags and bouquets of flowers on a cold, drizzling morning. It wasn't clear if Kim had visited any places in China on his trip from Pyongyang, the North Korean capital, to the border. Press reports speculate that he will drive the 170 kilometers to Hanoi, the Vietnamese capital, ahead of his Wednesday meeting with Trump.